Right before we begin, as this is the first post on thefilmconsole.com in 2019. And I would just like to wish Happy New Year to all my readers! Enjoy 2019, and this article on The Dragon Prince. With Many Lines Of Comparison And Similarities With The Last Airbender And The Legend Of Korra, The Dragon Prince Is an Engrossing Fantasy Set in a World As Diverse As Our Own And Promises To Be Another Smashing Animated Show From Aaron Ehasz. 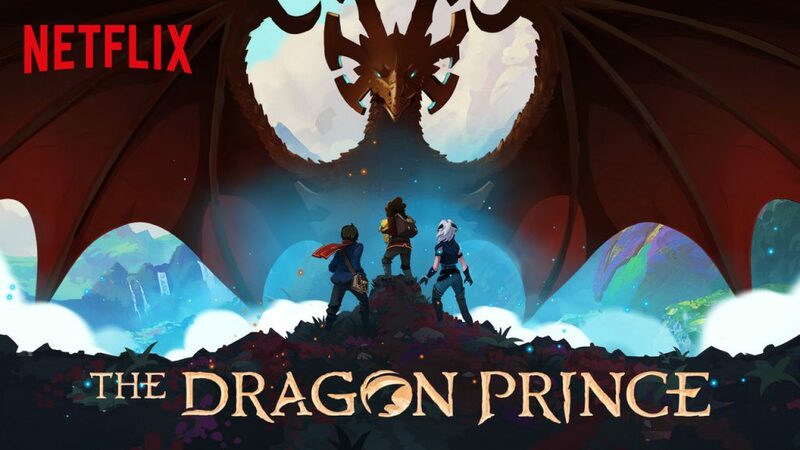 The Dragon Prince is a Netflix original following the likes of one of the greatest animated shows of all time, The Last Airbender. Created by Aaron Ehasz, the mastermind behind The Last Airbender and Futurama. And combined with Justin Richmond, best known for his work directing Uncharted 3. The Dragon Prince was an astounding surprise that left me in anticipation for Season 2. The show comes under their new studio Wonderstorm, which sports some of the greatest creative minds at its helm. As has been dutifully pointed out on an almost annual basis since its conclusion in 2008, Avatar: The Last Airbender is one of the best animated series of all time. Its character development and world building are still virtually unparalleled; its head writer, Aaron Ehasz, was nominated for an Emmy for his work on the show, which ended with a finale that drew 5.6 million viewers. Throughout, it handled heavy subject matter with humor, authenticity, and nuance that few others have come close to since.And that’s not for lack of good cartoons, many of which can trace their creative lineage back to Avatar—its groundbreaking sequel, Avatar: The Legend of Korra; Star Wars: The Clone Wars;and Voltron: Legendary Defender, to name a few. Now, just over a decade on, Ehasz himself is at the helm of a new series: The Dragon Prince, which premiered in September in 2018. From the first glimpse of gorgeous, hand-painted backdrops and bizarre hybrid creatures, The Dragon Prince’s heritage is apparent. Perhaps because it’s not beholden to an existing canon—as both Voltron and The Clone Wars were—the distinctive elements that made Avatar great shine through more clearly here than on any other show since. And the writers aren’t shy about planting in-jokes for fans of their earlier work: When we first meet one main character, she’s reading Love Amongst the Dragons, a popular play in the Avatar universe. The entire backstory of the universe that The Dragon Prince is set in is established within about 10 minutes, but if The Dragon Prince leans heavily on exposition at the outset, this front-loading is justified when we discover that the mythos we’ve been spoon-fed isn’t wholly true. Even early on, the series grapples with historiography and cycles of violence, highlighting the way the kids at its centre have been raised to blindly idolize their respective kingdoms—and more immediately, the adults around them. When 15-year-old would-be elven assassin Rayla (Paula Burrows) needs to put on a brave (and suitably intimidating) face, she resorts to parroting her mentor’s favourite phrase: “Justice will not be denied.” Yet her inability to follow through is what makes the rest of the story possible. She and the human princes Callum (Jack de Sena) and Ezran (Sasha Rojen), whom she was sent to kill, discover that the Dragon King’s egg wasn’t destroyed after all, setting the unlikely trio on a quest to return it to its rightful place and restore peace between the kingdoms. The Dragon Prince’s take on the genre is also a notably inclusive one. Co-creator Justin Richmond has said that he wanted to avoid the familiar fantasy trope of elves as “The Other,” where fictional species become a stand-in for real-world minorities at the expense of actual characters of colour. King Harrow and his son Ezran, who are both black, mark a clear break with that tradition. While Viren seems unconcerned with the costs and consequences of dark magic, he’s driven to those extremes by a desire to protect the king he loves. By having a cutthroat utilitarian worldview that makes a queasy kind of sense. Those shades of grey aren’t reserved for the adults, either; the characters who end up hunting the protagonists are initially introduced as their longtime friends. The show isn’t perfect. The slightly shaky animation and some shakier accents take some getting used to. Especially the elves’ range from terrible-Scottish to English, with no reason as to why. But for anyone who relishes in a good fantasy story or has longed for a new cartoon of Avatar’s calibre, The Dragon Prince seems set to deliver. It offers escapism without being blinkered, in a world that’s like ours in the ways that matter—and different from it in ways that are immensely satisfying. From the first glimpse of gorgeous, hand-painted backdrops and bizarre hybrid creatures, The Dragon Prince’s heritage is apparent and I highly recommend the show. Masterminded by Aaron Ehasz, who wrote my favourite television series of all time, The Last Airbender. I am now eagerly awaiting what he and Justin Richmond, under their new studio Wonderstorm, will bring us when Season 2 drops on Netflix in 2019. I loved watching this show and the review is spot on! Keep up the good reviews and shows. Pingback: The Dragon Prince Season 2 - The Spiritual Successor Succeeds!